The RabbleBerries — CD "Jam"
and John Taylor and Lynn Beak for their hospitality. And to Bishop, Milley, and Mak: no cats were actually harmed in the making of this album, but two were seriously inconvenienced, and another only slightly. 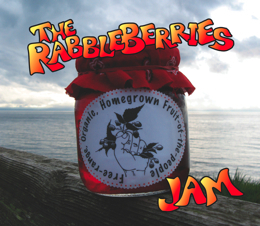 The RabbleBerries are pleased and excited to announce that our 1st album, “Jam”, is still available. We are very happy with the quality of the recording, done by Mike Freeman in our very own living room, and painstakingly and artistically mixed so it sounds “just like us”! 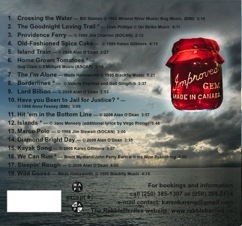 There are 18 songs on the album, both originals by Alan O’Dean and Karen Gillmore, and covers by all sorts of folks. This album is sure to have you singing along in no time—and probably dancing around the house too. To order one or more of these fine CDs, call 250-384-5174, or e-mail rabbleberries@ gmail.com—There will be a small charge for mailing (or if you are in Victoria, you can arrange to pick it up). Our CD price is $20 for 1 CD. Also, we’ll sell you 2 CDs for $30 and you can mix and match—we still have some Virgo Rising CDs left.